9Come visit the Fab Fair, the 2019 San Diego County Fair at the Del Mar Fairgrounds, from May 31 through July 4th (Thursday is July 4th). The fair is closed most Mondays and Tuesdays. There will be plenty of fun, concerts, shows and rides. You can get special deals including Free admission for kids on certain days, and the Best Pass Ever for only a discounted price. There are many things to do at the county fair. These are some favorites each year. Live Concerts - A variety of live concerts are offered on select dates, including country, rock, and Latin music. Beer or Wine Festival - Enjoy the San Diego International Beer Festival or The Toast of the Coast Wine Festival. 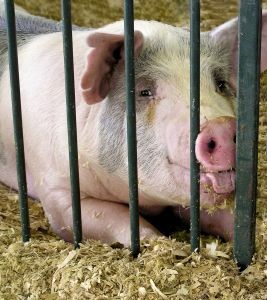 Animals - animal exhibits include sheep and goat pasture, pig pen, cattle pasture, pets, poultry, rabbits and pigeons. Old-fashioned contests at AgriFair - Bean bag toss, squash toss, onion toss, prune pit spitting, cherry tomato eating and more. Much more fun than computer games! World of Horses - Features 20 different breeds of horses. Free behind-the-scenes tours daily. Junior Livestock Auction - Saturday date TBD will be the auction of these blue ribbon winning animals raised by the 4-H, FFA and Grange kids. Rides and Games - The San Diego County Fair has some of the best rides. The Fun Zone features 39 exciting rides, and Kiddieland has more than 40 rides for the younger kids. Many games of skill too. See if you can win some prizes at the county fair! 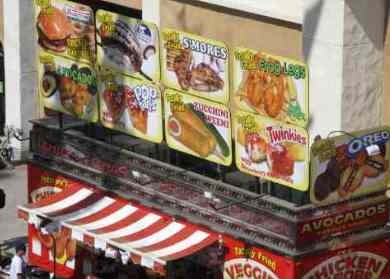 Food - Where else can you get such a variety of food. Can you handle those deep fried fair food? Exhibits - Exhibits include fine art, exhibition of photography, gems, minerals & jewelry, home and hobby show, creative youth and best of K-6 schools, and student showcase. San Diego County Fair is one of the main San Diego attractions in the summer in San Diego county. 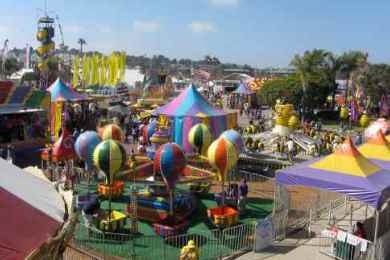 Centrally located in Del Mar at the Del Mar fairgrounds, it offers food, rides, shows, animals, concerts and lots of fun. Dates: SD Fair open from Friday May 31 starting at 4:00 PM through July 4th 2019 all days except it is closed on most Mondays and Tuesdays except for July 1 and 2. San Diego County Fair Hours: The fair opens at 11:00 AM on most dates. The fair closes around 11:00 PM on Friday and Saturday and 10:00 all other nights. Open until 11:00 PM on July 4. Some items close early – Kids’ Best area closes at 9:00 PM, World of Horses and The Farm closes at dusk. Kiddieland may close earlier. Check their schedule for exact times. Parking: tentative $15.00 per vehicle for general parking and $25.00 for preferred parking. RVs are not permitted in the on-site lots. Free parking and shuttle service is available every day at Horsepark, 2.5 miles east of the Fairgrounds at the intersection of Via de la Valle and El Camino Real. On weekends, and July 2, 3 and 4, free parking and shuttle service is available at MiraCosta College's San Elijo campus and Torrey Pines High School. Regular Admission Ticket Prices: Admission price is $20.00 adults ages 13 – 61, Seniors 62+ $14.00, Kids ages 6 – 12 $14.00 age 5 and under free. You can buy tickets online through Ticketmaster for a small fee, or at the Del Mar Fairgrounds (O'Brien gate). You can also purchase at San Diego Country Vons and Albertsons stores through July 4 and save $4 on adults and $1 on child tickets ($10 minimum purchase required). Ride Coupon prices can get expensive if you ride a lot of them. If you love the rides, see information below about the all day wristbands. Best pass Ever - This year the San Diego County Fair is offering a special pass. 21 days for $32. Available online and at the gate. Kids Free - Kids 12 and under are free TBD. Pay-One-Price Day - Wednesday and Thursday dates TBD. Purchase a wristband online or at the Fair that will allow you unlimited access to Fun Zone and Kiddieland rides from noon until 8:00PM. $38.00. Save an additional $5 if you buy Aquafina at a San Diego County 7-Eleven store. For details about the Buy Online Wristband for San Diego County Fair see www.sdfair.com. Fair Coupons - Keep reading for some of the best deals. Costco San Diego County Fair Discount Tickets - Check at Costco for some great savings. While supplies last. Last year the deal was $76.99 for 4 general admissions to San Diego County Fair. Includes four 2-for-1 drink coupons, one passport to savings coupon book, 1 parking pass, and 50 ride tickets. Military discount tickets - available for purchase on base only with appropriate Military ID: active duty, dependents, reservists, retirees, and DoD employees. Military discounts are not available at the Fair admission gate. For more information on prices and availability, call or visit a base ticket office near you. Food: You may bring a cooler and picnic inside the fairgrounds, but drinks must be in factory sealed container and no alcohol. There are 6 picnic areas inside the fairgrounds. Also, there are several nice restaurants nearby, such as the Fish Market, Tony’s and Fidel’s Mexican restaurants. And don't forget those outrageous foods that you can only get at the fair, like the deep fried ice cream bars. Dog Rules: - No dogs allowed except service dogs. San Diego County Fair Directions: - From Interstate 5 in Del Mar CA, take the Via de la Valle exit and head west (a left turn from the freeway exit if you are northbound; a right turn if you are southbound). Take Via De La Valle to Jimmy Durante Boulevard and turn left. Follow signs and the instructions of parking personnel to Fair parking. Also free parking and shuttle service is available every day at Horse park, 2.5 miles east of the Fairgrounds at Via de la Valle and El Camino Real. On weekends, and July 4, try the free parking and shuttle service at Mira Costa College San Elijo campus or Torrey Pines High School in San Diego, Calif.
Click on the link above to open the Google Map for the San Diego County Fair at the Del Mar Fairgrounds and other attractions in San Diego and southern California.